One program that addresses all 'R' sounds in all contexts! The 'R' Made Simple program is an entirely different approach to ‘R’ remediation. This is a great motor planning program that categorizes speech sounds into three categories - UPs, DOWNs, or SLIDEs - based on the placement of the articulators prior to production of the 'R' sound. A mnemonic color-coding system aids students in learning the correct tongue placement for each category. Methodology generalizes to any word in any context and overcomes barriers related to pronunciation, spelling, and dialect to become automatic over time. The foundation of this program is the Up, Down, & Slide Alphabet. It takes the English alphabet and reorganizes it into 3 categories: UP, DOWN, & SLIDE. Each category prompts proper tongue placement, and categories are based on the position of the tongue prior to the production of the 'R' sound. Students learn to identify the sound heard, look at the alphabet, and then decide if it’s an UP, a DOWN, or a SLIDE. Easy to teach strategies are simple for students to learn. Reduces the number of ‘R’ contexts that need to be taught. Targets articulation, language, and literacy goals simultaneously. Incorporates auditory, visual, and sensory modalities in all learning activities. Students take ownership by setting own goals and working toward achievement. Includes manual explaining this approach plus practice materials and drill sheets for articulation, language, and literacy. Understand 'R' Made Simple Methodology. Identify Up, Down & Slide alphabet. Identify correct tongue placement for each alphabet category. Analyze letters, words, picture cards, poems, and stories to improve speech, language and literacy skills. Correction of the 'R' sound in words, phrases, sentences and conversational speech. All contained in a sturdy box: 5.25" x 7.25"
Plus! A 30-minute training video to assist you in implementing the program. Contains instructions on how to categorize 'R' as Up, Down, or Slide for successful motor planning. Explains how sound discrimination training combined with motor planning can overcome barriers related to spelling, pronunciation, and dialect. Discusses how to incorporate language and literacy lessons with 'R' articulation therapy sessions. Ideal for SLPs working with children ages 7 - 18 years old. Nancy L. Geruntino, MA, SLP, has been a practicing speech-language pathologist for over 30 years providing services in private practice, clinics, and public school settings. For the past 12 years Nancy has been developing and perfecting a new intervention technique for ‘R’ remediation. Years of observing children failing when traditional therapies were used to remediate ‘R’ provided the motivation for Nancy to develop a ‘R’ remediation program that addresses all ‘R’ sounds in all contexts. 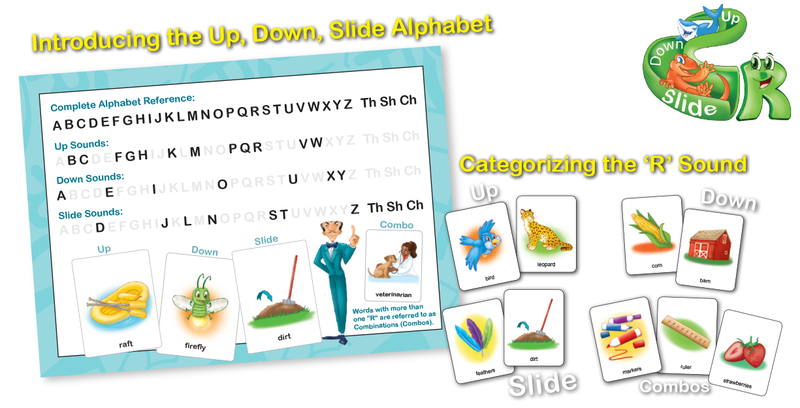 Through the creation of the Up, Down, & Slide Alphabet, this program can help speech-language pathologists teach students and clients how to categorize ‘R’ sounds into one of these categories to improve tongue motor planning and the pronunciation of ‘R’ to overcome barriers related to pronunciation, spelling and dialect. Nancy is the recipient of many school district awards including one for creating a speech improvement program for kindergarten students. She is also the author of 14 children's books. Nancy hopes that wide implementation of her program during the early school years will eliminate 'R' problems in middle school and high school. Financial — Nancy Geruntino is presenter of online CE courses sponsored by Northern Speech Services; receives royalties. Financial — Nancy Geruntino is author of the "R Made Simple" program published by Northern Speech Services; receives royalties. Nonfinancial — Nancy Geruntino has no relevant non-financial relationships to disclose.